Rebekah will be 17 in January so this will be her last Jr. Iditarod. She finished 21st, 13th and 3rd in the last three races. 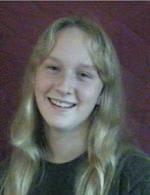 A homeschooled high school junior, Rebekah participates in 4-H and says she enjoys horse back riding in her spare time. After high school graduation, she plans to go to college and says, “yes?, she does plan to continue mushing.